Hey everyone! So this is a post you've been asking for - my Warrior Assault Systems Battle Belt setup and review. I've been running this piece of kit for around 8 months now - you've seen it in my Instagram posts and I always get loads of comments and compliments on it. I have definitely put it through its paces - through MilSim, CQB, woodland games and their respective weather conditions. The base of the belt is the Warrior enhanced PLB belt, this belt is built around utility and comfort. The new enhanced version of the PLB belt has longer side sections with extra molle loops so the user can carry more on the belt. 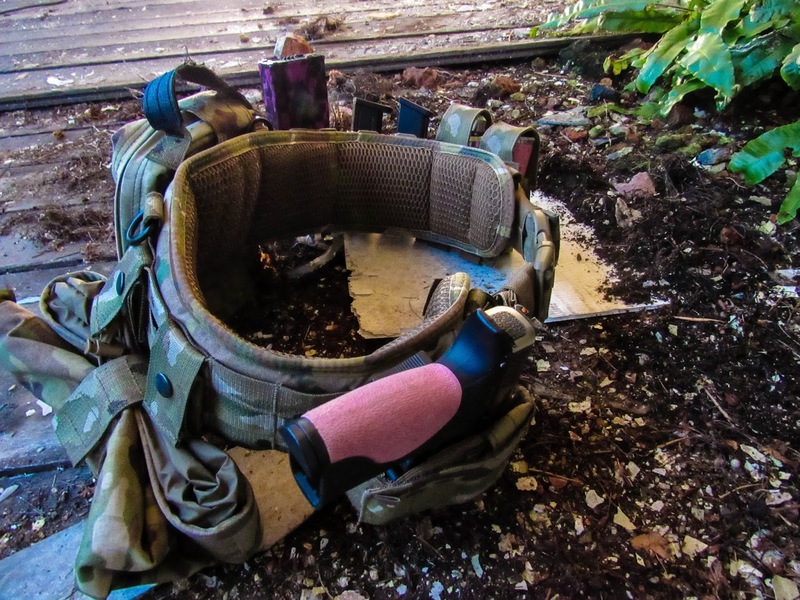 The inside panels of the belt have extra padded sections that are made from closed cell foam and finished with air mesh fabric to enhance the comfort of the user especially for prolonged periods of time (perfect for MilSim ops!) Warrior have also added an extended lumber section on the middle of the internal wall of the belt which helps the belt sit comfortably in the lower back and adds support. What I like most about the belt itself is how well it fits my hips - it sits perfectly and securely on them thanks to the padded sections. My hips are quite wide and I've found other belts tend to bruise them after prolonged wear. 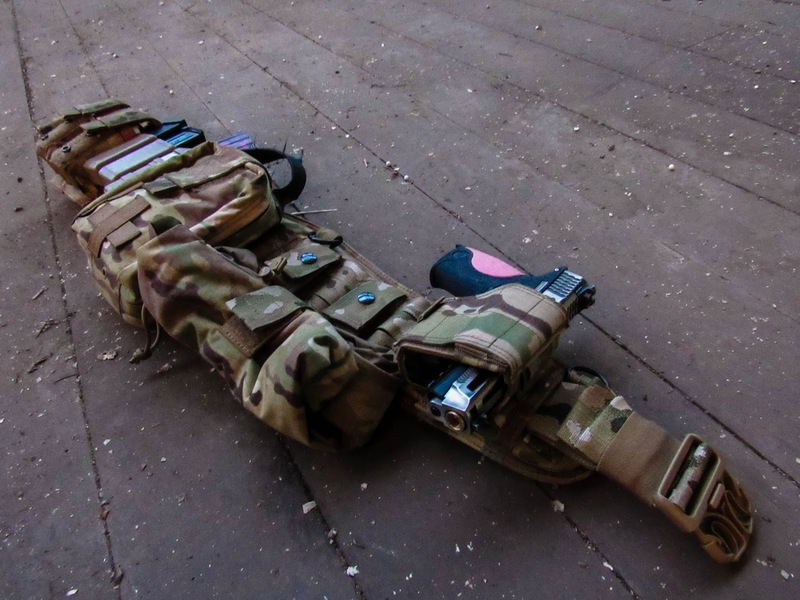 I don't need the harness to keep it secure but I think that may be one of my next purchases to keep the weight off my hips and make it a little comfier on longer Ops as the weight of pistols, mags and my BFGs weigh it down a lot. I am really impressed with the pouches that came in the shooters set up but as I said earlier in the post I have made a couple of variations - instead of the gen 2 roll up dump pouch, I have a gen 1 roll up dump pouch (this was due to stock availability), I only run 1 of the polymer mags included in the set up to make room for a double 40MM grenade pouch to store my BFGs. So, for the pouches that can be seen in the image on the left, starting from left to right! The double 40MM grenade pouch holds 2 of my BFGs, usually you will see me running my tri shot TRMR and the Alpha Tec Hex - now when holding these BFGs the pouches are a little snug and the pouch doesn't close fully even with the adjustable height closure due to their size, however when I run my TRMR E1 with the X4 base they fit very well and the pouch closes perfectly. This is not a flaw with the pouch itself - I just like to pack a lot of bangs! Haha. I really like the double grenade pouch! The polymer 9mm pistol mags are universal - as they have a spring device inside meaning it is a simple pull to release the mags allowing faster reload times - I use these mags when running my WE M&P and my ASG CZ P-09 with no issues. The polymer construction gives them good durability and longevity. Although I have mine in the accepted fashion, they have the capability to rotate 360 degrees to the users desired specification. Similarly to the M4 polymer mag pouch, this fits any type of M4 magazine including Dytac Hex Mags and PTS P-Mags. There isn't much to say on the polymer mags but they are well constructed and the colour goes well with MC. 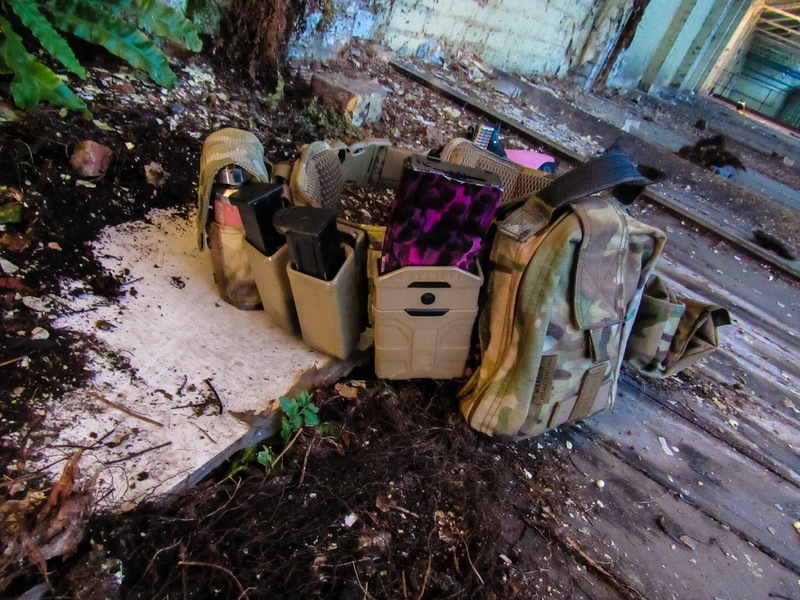 The personal Medic rip-off pouch is one of the biggest pouches on my belt and can hold a tonne of kit in the Mil Spec elastic compartments and tabs inside that help organise it. I currently use mine to store my MilSim med kit (bandages, alcohol wipes, plasters, hand sanitiser, tablets etc) and it still has room for scissors, a torch and a whistle. The pouch can be mounted on rigs and leg plates to so if you don't have a molle belt and fancy running one do not fear - it is held in place by strong velcro and backed up by a webbing/clip enclosure. To use, unclip the safety tab and either unzip to use whilst on the belt or pull the handle down hard to rip the pouch from the panel. My one moan with this pouch would be that the leather material on the handle has frayed at the edges and this can be seen in the photos, fortunately, this has not affected the use of the product as of yet. The last item on my belt, and my favourite item is the WAS universal pistol holster! This piece of kit is fantastic and is easily the best pistol holster I have used - it is fully adjustable so it can accommodate most large and small frame pistols, I have run a WE Glock 18C, WE M&P and the ASG CZ P-09 in this holster with no issues. You adjust the holster by way of a velcro closure, just pull it open, place the pistol in the holster, tighten and voila! Good to go! The pistol is secured by the molded composite internal housing and is released by pressing the push down thumb release. The main attraction of this holster is it's capability of accepting a wide variety of pistols - when I'm shopping for RIFs or when I'm sent a pistol for review I don't need to worry bout it not fitting in the holster. I'm not sure how it would fair with a revolver or a DE but I'd be really interested to find out. My pistols sit securely in the holster with no wobble or rattle and there's no chance of an accidental discharge. The thumb release is quite snappy and allows for a quick draw. 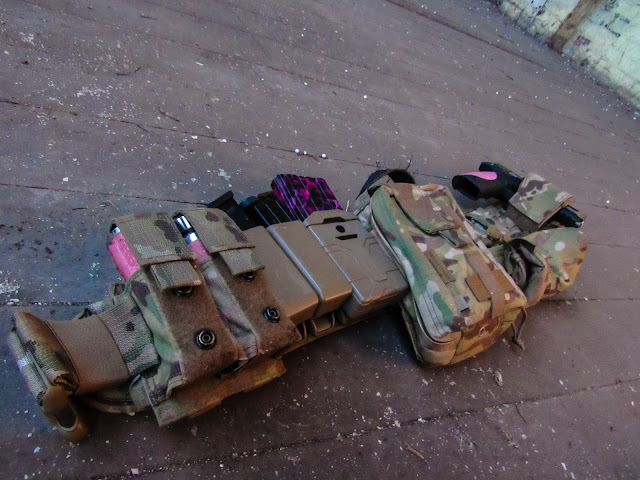 All the materials on the belt and the pouches are 500D Cordura Crye MultiCam I.R Fabric and the PLB belt itself has genuine MultiCam US Mil Spec webbing - with a breaking strength of 1000lbs and it is treated against mildew and UV light to extend longevity of the product. 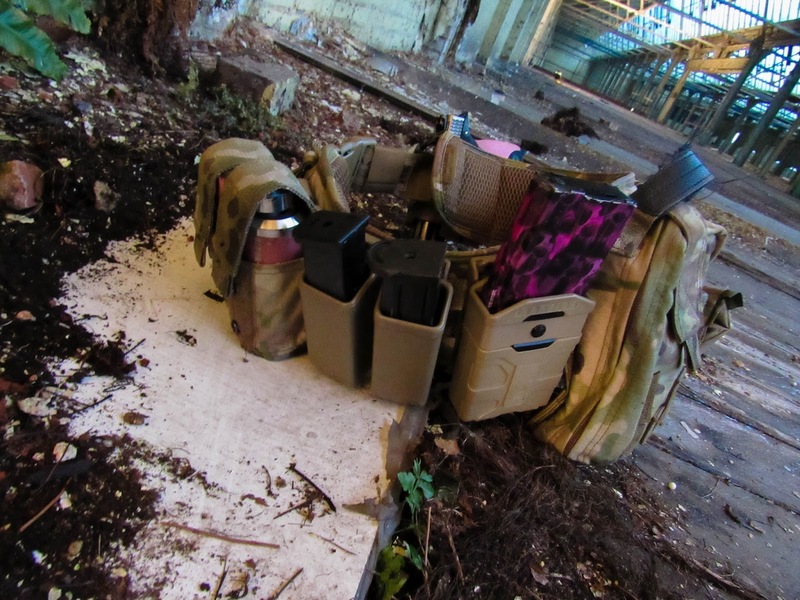 Overall, I am really happy with the quality and functionality of the product and would recommend the set up and individual pouches, however I am a tad disappointed in the finish of the leather on the medic pouch but this would be my only moan regarding it! Any comments or questions? Leave them in the comments section below! Had to comment because nerd. Try switching your bamser hoster placement to behind the m-mag hoster. That way you can shave time off your reload on both sidearm and long gun while keeping your gun in your workspace and head on a swivel. The bangers will come naturally anyways and isnt something you can prep to throw in a crit situation anyhow. FFA Announces the Support of ASG!